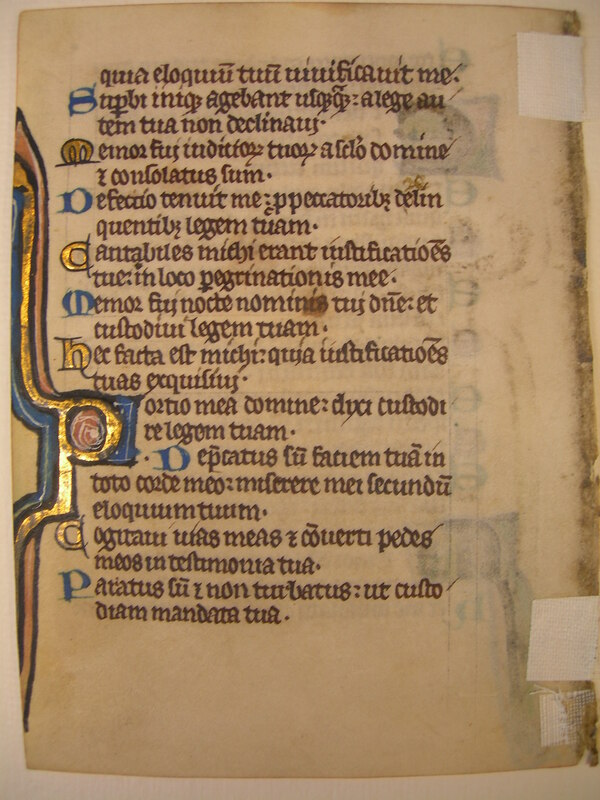 Text: Psalms 118:40-50 (recto) and 50-60 (verso). Reconstruction Note! 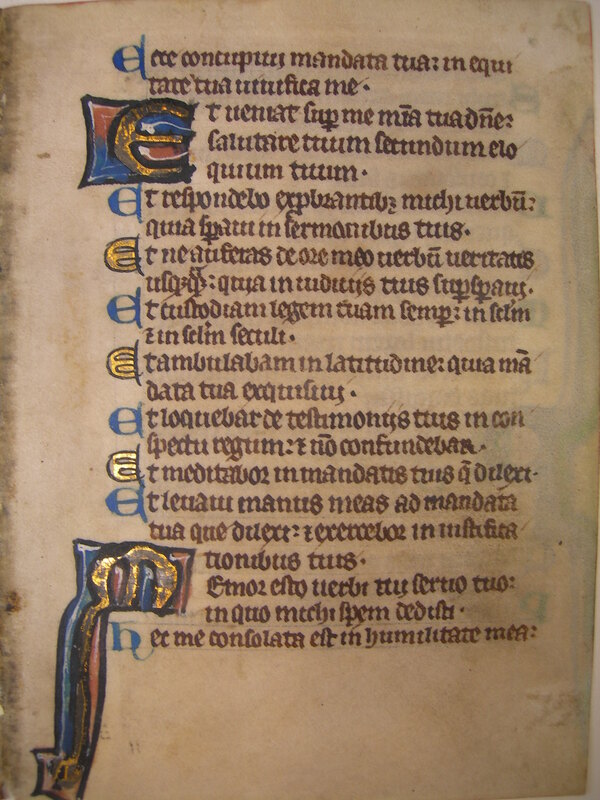 In Ege's original manuscript, this leaf preceded what is now Leaf 12 in the Cleveland Public Library portfolio. Together they contain Psalms 118:40-80. Ecce concupívi mandáta tua: in æquitáte tua vivífica me. Et véniat super me misericórdia tua, Dómine; salutáre tuum secúndum elóquium tuum. Et respondébo exprobrántibus mihi verbum, quia sperávi in sermónibus tuis. Et ne áuferas de ore meo verbum veritátis usquequáque, quia in judíciis tuis supersperávi. Et custódiam legem tuam semper, in saeculum et in saeculum saeculi. Et ambulábam in latitúdine, quia mandáta tua exquisívi. Et loquébar in testimóniis tuis in conspéctu regum, et non confundébar. Et meditábar in mandátis tuis, quæ diléxi. Et levávi manus meas ad mandáta tua, quæ diléxi, et exercébar in justificatiónibus tuis. Mémor esto verbi tui servo tuo, in quo mihi spem dedísti. quia elóquium tuum vivificávit me. Supérbi iníque agébant usquequáque; a lege autem tua non declinávi. Memor fui judiciórum tuórum a saeculo, Dómine, et consolátus sum. Deféctio ténuit me, pro peccatóribus derelinquéntibus legem tuam. Cantábiles mihi erant justificatiónes tuæ in loco peregrinatiónis meæ. Memor fui nocte nóminis tui, Dómine, et custodívi legem tuam. Hæc facta est mihi, quia justificatiónes tuas exquisívi. Pórtio mea, Dómine, dixi custodíre legem tuam. Deprecátus sum fáciem tuam in toto corde meo; miserére mei secúndum elóquium tuum. Cogitávi vias meas, et convérti pedes meos in testimónia tua. Parátus sum, et non sum turbátus, ut custódiam mandáta tua. ...because thy word hath enlivened me. 51 The proud did iniquitously altogether: but I declined not from thy law. 52 I remembered, O Lord, thy judgments of old: and I was comforted. 53 A fainting hath taken hold of me, because of the wicked that forsake thy law. 54 Thy justifications were the subject of my song, in the place of my pilgrimage. 55 In the night I have remembered thy name, O Lord: and have kept thy law. 56 This happened to me: because I sought after thy justifications. 57 O Lord, my portion, I have said, I would keep the law. 58 I entreated thy face with all my heart: have mercy on me according to thy word. 59 I have thought on my ways: and turned my feet unto thy testimonies. 60 I am ready, and am not troubled: that I may keep thy commandments.